THE BULLY PULPIT-HISTORY LESSONS FOR TODAY! It is rare that I blog about a book with 400 pages still to read but if you or a member of your family loves history then place The Bully Pulpit, Theodore Roosevelt, William Howard Taft and the Golden Age of Journalism at the top of your holiday list. Doris Kearns Goodwin has outdone herself by telling the story of these two presidents at the turn of the 20th century in an economic enviornment which is very relevant today. Early on, this prodigious work of history will place the reader both then and in 2013! 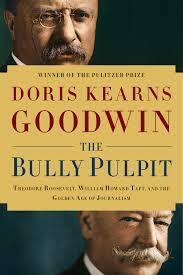 Goodwin lays the groundwork of the lives of TR and Taft , one most famous and the other mostly forgotten. Her research leads to a greater understanding of how the power of the presidency combined with investigative journalism can dictate national policy. There is no bully pulpit without the press. This of course is a lesson learned long before the internet and cable news! Learn of the tremendous influence of McClure’s magazine during TR’s rise. Of course , during this period of reflection on Abraham Lincoln, do not overlook Goodwin’s Team of Rivals. I had not read any books by George V. Higgins who wrote over 30 wonderful works of fiction including the Jerry Kennedy Series, A City On A Hill, The Sins of the Fathers and The Agent. 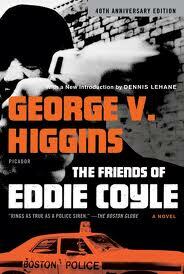 Higgins died on 1999 and left behind a treasure of novels and THE FRIENDS OF EDDIE COYLE sets itself apart as a “game changer.” THE FRIENDS OF EDDIE COYLE is considered by some reviewers as one of the greatest crime novels ever written! Set in Boston in the 1960s, the book is 80 percent dialogue bringing together a cast of second and third-rate mobsters, informers and undercover cops with the irony that Eddie Coyle in fact has no friends and neither does anyone else the Boston underworld. I draw a comparison to Carl Hiaasen’s Lucky You in that there is a certain similarity between the helplessness of Eddie and the bumbling lottery ticket thieves in Hiaasen’s novel. The book also connects with Jimmy Breslin’s The God Rat, the true story about the informer in the famous New York City bad cop trial in the Gotti and Genovese era. By the way, I recommend both of these references as additional great reads. Of course Breslin and Hiaasen each have long lists of additional wonderfully worthy books. THE FRIENDS OF EDDIE COYLE is a photograph in brilliantly written evocative dialogue within the Boston criminal underworld, reflecting the mentality of the players and engaging the reader in the inevitable outcome. If you enjoy this genre dig more deeply into the writing of Georg V. Higgins. The book was also made into a highly acclaimed movie starring Robert Mitchum in 1973.